3D laser scanning is a way of capturing a physical object’s exact size and shape, so that it can be viewed in the ‘computer world,’ as a three dimensional digital representation. 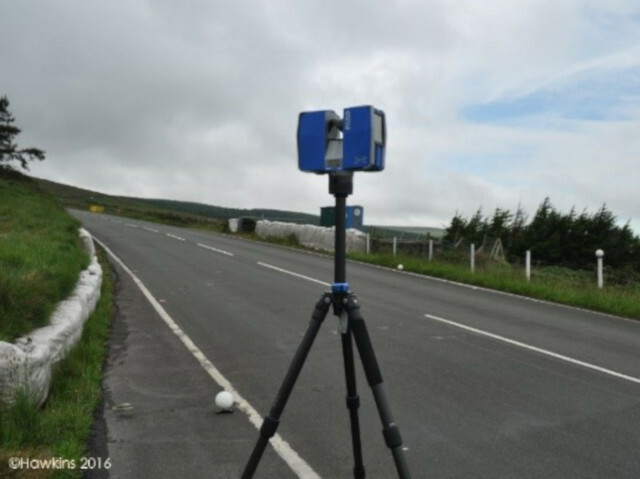 3D laser scanners have become a well-established tool in the field of surveying, and more recently have been a common method adopted by Police Forces for recording the scenes of road traffic collisions. Figure 1 shows the two types of 3D laser scanner that Hawkins uses: a traditional tripod‑based 3D laser scanner (on the left), and the new handheld 3D laser scanner (on the right). The tripod-based laser scanner has been used for surveying larger areas, including scenes of collisions; the new handheld 3D laser scanner is used for surveying smaller objects. Hawkins is now using handheld scanners for creating permanent, accurate and detailed records of vehicles damaged in collisions. The accuracy and precision of recorded measurements are what primarily make 3D laser scanning invaluable for collision investigation and reconstruction. However, computer models created from the 3D scan data can also be used to create photographic, realistic visualisations. These visualisations can be rendered as either individual figures, for inclusion in a report, or as video files. Videos that give ‘fly around’ overviews of the scenes of both collisions and collision-damaged vehicles can also be created. These visualisations give the observer a better understanding of spatial arrangements than conventional photography. A further advantage of a 3D model is that it can be viewed from any angle. Figure 2 is a screen shot showing the 3D model that resulted from a tripod-based laser scan of a car park. All of the scanning work was carried out at ground level. However, by moving the viewing point, it has been possible to create the illusion that a photograph has been taken from an aerial platform at some position over the scene. Furthermore, by viewing a model from directly overhead, precise scale plans can be created quickly and accurately by creating outlines and marking key features. The handheld laser scanner that Hawkins uses was launched in 2015. It is compact and manoeuvrable, which allows 3D scans to be performed in confined areas, where previously it would have been unfeasible to use the traditional method of tripod-based 3D laser scanning. It is these features that enable the handheld scanner to record the interior compartments of damaged vehicles, allowing a permanent record of seat positions and intrusion damage to be recorded, measured and analysed. Unlike the tripod-based scanner, the handheld scanner does not project a laser beam. Instead, it works by projecting a grid pattern of infrared light. Two infrared cameras then record the shape of the grid as it distorts over the surface. The information from each scan is recorded onto a Microsoft tablet. Individual scans are then registered together to create a 3D model, which can then be navigated and analysed. The tool has a scanning range of approximately 3 metres, and it is accurate to within 1 mm at a distance of 1 metre from a surface. Figures 3 and 4 show the results of a 3D laser scan performed on the interior of an undamaged vehicle. Such images of an exemplar model of a vehicle, together with those generated from a scan of a damaged vehicle, can help interested parties to visualise the extent of the damaged caused. Figure 4: A second screen shot from the 3D laser scan model of the passenger compartment of a vehicle as viewed from above. A useful feature of having a navigable 3D model is the creation of cross section views. Figure 5 shows a cross section that was taken through the offside of the passenger compartment previously shown in Figures 3 and 4. The cross section was taken in line with the centre of the driver’s seat and steering wheel. A cross section view allows exact measurements to be taken as part of an assessment of occupant contact with the vehicle in an impact. As an example, a measurement was taken on Figure 5 between the driver’s seat backrest and the steering wheel. The accuracy of measurements taken from the 3D model reduces the uncertainty when considering seat positions or proximity of occupants to crushing damage. Figure 5: A cross section view taken longitudinally through the driver’s side of an undamaged vehicle. The models are also excellent when making comparisons between damaged vehicles and undamaged exemplar vehicles. Cross sections can be taken through the 3D model of a damaged vehicle and compared with the 3D data from an undamaged exemplar vehicle. To aid in the visualisation, cross sections can then be overlaid to help in understanding how the shape of the vehicle has changed as a result of a collision. Figure 6 shows a cross section taken through the passenger compartment of a damaged vehicle. The vehicle had sustained a severe impact to its nearside at high level. The cross section was taken in line with the base of the rear seat cushion, as viewed from the front of the vehicle. Despite wearing a seatbelt, the rear seat occupant received a head injury. Measurements taken from the cross section view of the computer model, combined with the known size of the occupant, helped to establish that the injury was quite probably the result of the collision damage, and not due to the occupant’s failure to wear a seatbelt correctly. Figure 6 A cross section view taken laterally through the rear seat area of a heavily damaged vehicle. If an investigator is considering how a particular occupant came to receive any injuries, creating a computer model, from which any measurement can be taken, is of great assistance. Often, Hawkins investigators will examine a vehicle and take a few key measurements; however, at a later date (once the vehicle has been disposed of), a medical expert might wish to know a measurement that was not recorded. Having a navigable, dimensionally accurate model ensures that measurements of any feature of interest can also be made retrospectively. As a result, it is no longer necessary for insurers to pay for long term storage of damaged vehicles, because, after a 3D scan, the potentially useful dimensional information has already been captured and stored digitally. James Wade has an MEng in Automotive Engineering from the University of Leeds, and a background in both automotive engineering and vehicle design. In 2010 James set up his own practice, specialising in the maintenance, modification, and restoration of classic cars. In 2014 James joined the Hawkins Reigate office and has investigated numerous road traffic collisions using traditional reconstruction methods as well as more modern techniques such as CCTV analysis, vehicle crash data and the use of 3D laser scanners.